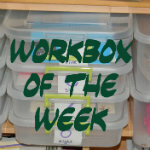 I try to get creative with the workboxes, but in reality there are ten of them to fill each day and I have limited time and imagination. In some of the workboxes I place worksheets and other pages from workbooks that I think Margaret will enjoy. Some of the best workbooks are made by Kumon. Kumon has a lot of different books all for various ages and offering different activities. For Margaret's age and ability there are handwriting, cutting, pasting, phonics, basic math, and crafts. Most of the books are full color on thick glossy pages. We own several of these books. I picked mine up at Barnes & Noble using my teacher discount card. Average price is about $7.00. Margaret really enjoys these books. Here she is displaying her paper watches that she created from the 'Easy Crafts' book. Work for Teacher: Little or none.